AMMONNEWS - Minister of Foreign and Expatriates Affairs, Ayman Safadi, and Secretary of the Executive Committee of the Palestine Liberation Organization (PLO), Saeb Erekat, stressed that Jordan sees eye to eye with Palestine that setting up a Palestinian state on the borders of 4/6/1967 with East Jerusalem as its capital is the only solution for comprehensive peace. 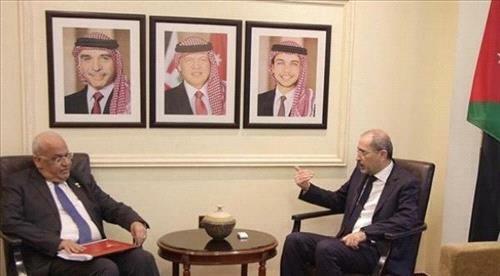 During the meeting, which was held in Amman on Monday to discuss the latest developments of the Palestinian cause, Safadi and Erekat emphasized the Jordanian-Palestinian complementary efforts to protect the occupied city of Jerusalem and its Islamic and Christian holy sites under constant coordination between the two countries leaderships and institutions. Safadi said protecting the city's Islamic and Christian holy sites is a priority and His Majesty King Abdullah, Custodian over the Holy Sites in Jerusalem, is harnessing all the Kingdom's capabilities to preserve Jerusalem's Arab, Muslim and Christian identity and holy sites, as well as its historical and legal status quo. The meeting reviewed the latest developments of the Israeli closure of the Bab al-Rahma Gate at al-Aqsa Mosque and the Kingdom's efforts to protect it. Safadi reasserted Jordan's rejection of the Israeli court's decision to close the Bab al-Rahma Gate and any Israeli actions aim to change the status quo of the holy city, stressing that Jordan doesn't recognize Israel's jurisdiction over East Jerusalem and that Jerusalem Awqaf Department is the sole and exclusive authority to administrate al-Aqsa Mosque/al-Haram al-Sharif according to the international law. For his part, Erekat lauded Jordan's efforts, led by His Majesty King Abdullah, to preserve the Arab and Islamic identity of the holy city and to protect the Bab al-Rahma Gate.